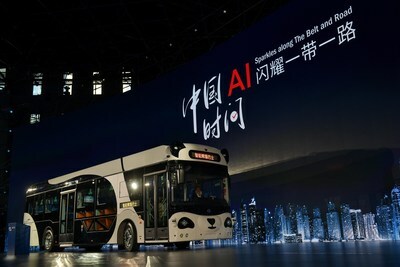 SHANGHAI, Jan. 18, 2019 /PRNewswire/ — On January 18th, DeepBlue Technology’s Smart Panda Bus, an Artificial Intelligence (AI) driving bus, made its debut at the “New Generation Artificial Intelligence Future Development Summit” in Shanghai and is looking to redefining public transportation. The Smart Panda Bus is a multi–functional AI-based autonomous vehicle that incorporates eight different core technologies from DeepBlue Technology, working together to solve various pain points for commuters all over the world. The Smart Panda Bus leverages the latest AI technologies all in one product. Some features are: AutoPilot, Finger Vein Recognition, Voice Interaction, Precise Advertising Push, Vehicle Monitoring Robot, Intelligent Unmanned Retail System, Abnormal Behavior Monitoring System and Intelligent Escape Emergency Handling System, which has never been implemented in a public commuter transport until now. On the Smart Panda Bus, passengers can take the bus and go shopping by swiping their hands through the accurate biometric identification system, while an on-board robot monitors and records any suspicious behavior in real time, makes timely broadcast at the back-end for early warning and activates the intelligent escape emergency system. It heralds a big step towards the development of smart cities of the future, something that many AI industry elites, companies, and even China’s city officials and overseas guests from the Belt and Road countries gathered together to discuss. The Smart Panda Bus received enthusiastic support and will land in Asia and Europe this year. Countries such as Germany, Luxembourg, Italy and Greece have shown great interest in this product. It is expected that Smart Panda Bus will be available to Europe in 2019. City officials in Bangkok has already approved the BRT, another autonomous driving vehicle of DeepBlue Technology, to start trials around the middle of this year. Shanghai-based DeepBlue Technology aims to be a global company that will be able to serve people all over the world. At present, the company is active in Europe, the Middle East and Southeast Asia, and so far, has signed smart city cooperation agreements with Greece and Italy. You Are an Aereo Subscriber, Now What?